I spend a large part of my day reviewing your ads at MilitaryAvenue! Our new MAPP partners increase every day, some wisely update their ads, others place additional ads after their first (we allow three free ads within 100 miles) and some upgrade to get better visibility! While reviewing these ads I see how frequently ads are being opened by our viewers with our Tracking System. I try to decipher why some ads are being visited (clicked on) more frequently than others. I have not done a scientific study but here are some ideas from my gut! I may have to do the scientific study someday when time and resources allow. First, the ads opened most frequently are what the consumer needs. The ads speak to the military community with their service/product. This is a tough economic time but the military community is still relocating and looking for you in their new community! Wonder how long settling in takes? More than a year for this family who relocated 18 times and we were pretty good at it! Catch them before they get there or at the front door! Second, the Military Reward is seen as military friendly! I have written about this before but I can't say it enough. The discount does not have to be large to be appealing but how you say it needs to be large! Thank them for their service to this great country! Remember we are at war and many have deployments in the future, are deployed or just returned. Note: A military family can tell when you do the minimum to get a free ad. Third, tell them about yourself in the ad! There is a lot of room in the business profile, professional credentials, etc. that allow you to explain who you are. Remember, they don't know you from Adam! They are frequently new in the community--looking for a friendly face, product, service and you have a chance to tell them about you! Sometimes once is all you get! Putting your best foot forward is the old cliche! If you have a section for additional information with a paid ad, use it! Same with the images! They speak to someone about your business! Send them a message--friendly, welcoming, comfortable, etc! Fourth, network with the military community and your fellow business friends! Tell other military friendly businesses about MilitaryAvenue and increase the number of ads at your installation. The more popular the installation, the more views, visits you get! Willing to take the lead at an installation? We provide a discount coupon for paid ads for multiple sign ups! Contact me at dale@militaryavenue.com for more information. Finally, keep your ad up and current! I know we are all busy but 5 minutes a month to Log In and review your ads currency, edit and update! Also, you can check on the visits and see how you are doing with the Tracking System! Maybe the ad needs tweeking to bring more viewers to your business? One last comment for you! The kiss of death for an ad is one that is built and walked away from for a year till renewal! Stay involved! Sign up for Answers (help the military community by answering a question about your area); Twitter with military personnel. 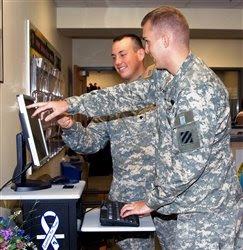 Many military offices/units now have twitter accounts and we are starting to post them on the site. Have a great summer! Who holds the purse strings of a military family?